The Ekklesiasterion. (Photo by Clemensfranz)This low museum complex on the right side of the road is the first thing you hit while heading down into the Valley of the Temples. You enter the Agrigento museum through a little garden and a catwalk over the Ekklesiasterion, a 4th-century BC assembly arena (it looks a bit like a flattened ancient theater, with curved tiers facing a stage). Inside the museum, Room 3 contains an outstanding collection of superbly painted vases spanning the 6th to 3rd centuries BC—some Attic, but many from Agrigento itself. 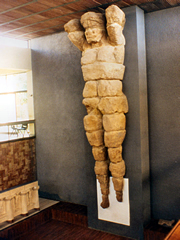 The massive telamon in the museum. (Photo by Mr Fogey) Room 6 is devoted to the oversized Temple of the Olympian Zeus, with models of how it once might have looked, and also cinludes the museum's most striking exhibit: a reconstituted ★ telamon stacked up against one wall. In the rest of the museum, look for the 2nd-century BC alabaster sarcophagus of a child, carved with happy childhood moments and a touching death scene, and the 5th-century BC painted krater from Gela showing a battle with the Amazons. 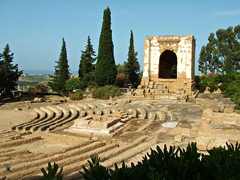 Across the road from the museum lies the Insula Romana, the remains of Roman-era Agrigento.